Spring and summer demand a great sandal like the Birkenstock Mayari. 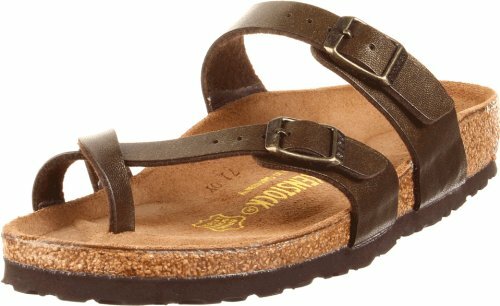 This women's sandal features a thick yet supple leather upper with adjustable buckles for a custom fit. The suede lined, contoured footbed will mold to the shape of your foot creating a custom footbed that supports and cradles you each and every step. A raised toe bar is designed to encourage the natural gripping motion of your feet, exercising your legs and aiding circulation. The anatomically correct cork/latex footbed, crafted from cork that is 100% renewable and sustainable, encourages foot health. This Birkenstock sandal also has a flexible EVA outsole that offers lightweight, shock absorbing support with lasting durability. Enjoy the warm weather in the Birkenstock Mayari.